Chances are good you’ve purchased or received a custom printed t-shirt at some point in your life. Perhaps you participated in a charity event, joined a sports league, or supported your favorite band with the purchase of a cool, new tee. Any occasion is a great time for a new tee. If you’re interested in creating a custom tee but don’t know if, or when, or if it’s appropriate, check these TOP TEN reasons to create your own custom t-shirts. When you’re wearing the same custom t-shirt as someone else, you know that you’re connected. Custom t-shirts instill your school student body with pride or your workplace with a sense of team spirit. Construction workers are taking advantage of three safety colors, Safety Green, Safety Orange, and Safety Pink to standout on the job site. When you have your company logo custom printed on one of these three shirts, it will be easy for others to spot your crew and avoid accidents. Adding a safety message on the front of the shirt is a great way to reinforce the importance of safety on the job site. Many people create custom t-shirts to celebrate a special occasion such as a family reunion, Nana’s birthday or bachelorette party. You can create tees to celebrate an accomplishment, such as a winning a dance championship or band competition. Celebratory shirts also bond the group together. Custom tees also are used for practical reasons like identification. With a logo on the front and a name and number on the back, sports teams use tees as their uniforms. Volunteers at charity events and counselors at camp can be easily identified when they wear specific shirt colors. These t-shirts also instill a sense of teamwork and pride. Sometimes custom tees are created purely for the sake of art. There is just something about seeing one of your designs being worn on a shirt by someone at the mall. A custom t-shirt can be a wonderful gift for friends, family, or colleagues. A graphic designer may create custom tees for all of their friends. A travel consultant may give custom tees to their clients as a souvenir. And who wouldn’t want a really cool tee wrapped under the Christmas tree. 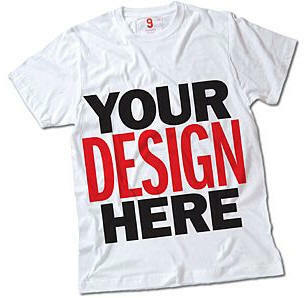 Custom printed t-shirts are widely used to promote a company and increase revenue. Universities often use t-shirts as promotional items for prospective students. Companies use free t-shirts for conventions, job fairs and festivals. Selling custom made t-shirts are a great way to raise money. Whether it’s buying a t-shirt to support the tornado victims in Joplin, MO and Moore, OK or contributing to help pay the medical bills of a child, people want to help. At the Greek Corner, our MoneyTees program makes raising money so easy, you’ll think it grows trees. Whether it’s to Save a Tree, Save the Planet or Jesus Saves…nothing expresses your opinion quite like a bold, graphic, custom printed tee. You have now passed TOP TEN REASONS TO CREATE A T-SHIRT 101! Now how many reasons there are to create your own custom tees, give us a call today to get started. To learn more about us, check out Greek Corner Screen Printing and Embroidery in Springfield, MO. We offer full service textile screen printing at competitive rates. Our talented artists will work with you to create exceptional artwork for your screen-printed garment. Whether you are looking for tees, hoodies, jackets, sweatpants, shorts or other apparel, we can do it all. To learn more, call us at 417.865.8011 or request a free quote. We look forward to hearing from you soon.